Fancy a $500 refund netting you potentially over $450 profit? 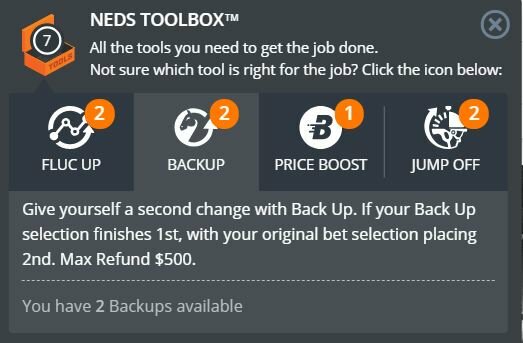 Using our calculator you can quickly identify if you have found a suitable bet to take advantage of Neds 'Back Up' Offer. Step 1 - Find a horse, greyhound or harness race with 2 clear favourites. When you have found a suitable race then enter the back and lay odds as well as the lay odds into the calculator above. The number of 'back ups' you receive is account dependent. This offer suit a race with 2 clear favourites. Full terms of the offer can and should be checked on the Neds site here are a couple of key terms of the offer as displayed on Neds page on Friday 5th October. Back Up - Tap 'Back Up' and choose a backup runner. If your backup finishes 1st and your bet places 2nd, we will refund your stake up to $500. Get a second chance with Back Up, for Fixed Odds Win-only betting. Stake returned if your Back Up selection finishes first with your bet placing second. Available on selected Australian and New Zealand horse, harness and greyhound racing where the 'Back Up' icon is visible. Full Back Up terms and condition apply.